At this point in movies, it is hard to bet against Samuel L. Jackson. He has a commanding charisma that has progressed his career as much as his talent has. It is pretty clear that he loves to work, and money is never really an issue with him. Because he’s had lead roles and supporting roles, he’s been in blockbusters and indie fare. What all of that has in common is that Jackson always treats every role as a challenge to overcome, and he seems to have a hunger to do better than before, no matter how mighty the impact of his presence maybe. When you have Samuel L. Jackson is playing the President of the United States of America, well, that idea just sounds exciting. Jackson’s personality set into a man running our country? Has to be good right? But throw him into the Finnish woods being chased by terrorists? Now that is something I have to see, and it is something I am very glad I had the opportunity to see. 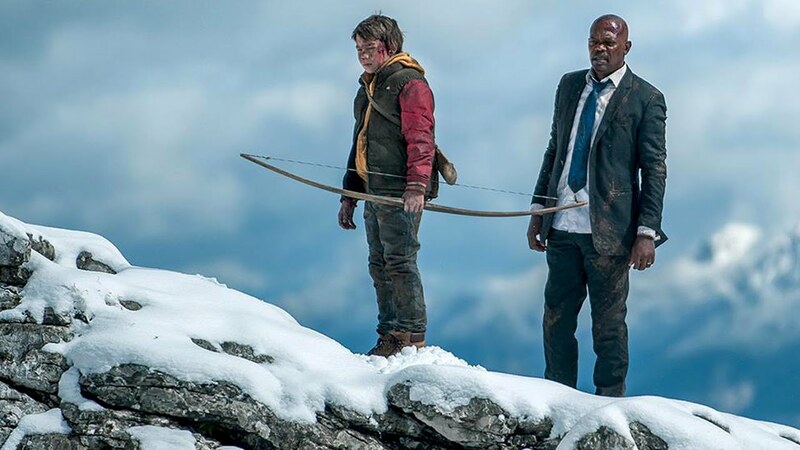 “Big Game” is an action movie, but not your typical action movie. Yes, it features wickedly silly, yet giddy one-liners. Yes, there are action moments that are flat out preposterous. Yes, much of the movie is very tongue-in-cheek. It has all the best ingredients to make a great action movie, except the classic “Mexican Standoff.” Yet, “Big Game” hits harder than most action output recently. I think that’s because “Big Game” is completely confident in itself, and it’s completely in love with itself. This is a movie that knows what it is, and it will aim to please. This is not a movie that tries be anything else except a delirious good time. Underneath all of the familiar, there was still room for a couple of surprises, and those made me smile. Now, the premise may sound silly. Air Force One gets attacked by terrorists while on its way to Europe, and the President is evacuated at the last second. The President is on the run from the bad guys, and his only help is a young boy who was hunting in the wilderness. You maybe snickering, but hear me out. Onni Tommila plays Oskari, and at the beginning of the movie, his dad abandons him in the woods. In Oskari’s village, it is a rite of passage for all boys to survive one day and one night in the Finnish woods, and hunt, kill and bring back whatever they encounter. Oskari’s father is considered the best in the entire town, which puts great pressure on Oskari, but he’s a determined young man who feels he can live up to his father’s stature. So when he’s thrown into this whirlwind of terror with the President, he feels this could be his big break, his way of proving he is a man to the rest of his village. The buddy system created by Tommila and Jackson is a stroke of genius. With Jackson’s charisma, and Tommila’s wonderful conviction, these two make a great team. Their scenes and dialogue together had a silly smile on my face throughout the entire movie. Then there is Mehmet Kurtulus, who plays the main villain in the movie. Kurtulus’ character is kind of like a Bond villain, but a little bit edgier. His grand plan is broad, but a little sadistic as well. This isn’t the type of villain we are used to seeing in movies like this, but that helped the movie instead of hurting it. Kurtulus’ character had some big moments of humor, and some big fight scenes that made me squeal. Any great action movie needs a great villain, and “Big Game” passed that test on all fronts. There are several great actors sprinkled into the movie, all of whom make an impeccable impact. Jim Broadbent, so good in everything he does, delivers some big laughs as a consultant helping find the President. I also very much liked the work of Ted Levine and Victor Garber. I also have to give a special shoutout to Ray “Volstagg” Stevenson, who delivers another awesome “tough guy” role. I love that this is a movie that uses recognizable but not totally superstar faces. Everybody has something specific to do, and everybody does it well. One thing that blew my mind was that this felt like an action movie involving real people. Too often in action movies, somebody who clearly has no fighting expertise will become a superhero at the drop of a dime, merely for plot convenience. It is often quite distracting, and completely takes me out of the movie. Not here, while there is quite a lot of material in this movie that takes some leaps in logic, it certainly felt like a breath of fresh air to see a movie inhabited by real people. This summer so far has been slow and underwhelming in the world of summer movies. But here is a good one not playing in theaters that you are not going to want to miss!